On August 1, 1981, something happened to cable television – something that would define pop culture, change generations, and shape an industry. That something had a name. The name was MTV. It launched at 12:01 in the morning, ushered in by John Lack (then the Executive Vice President of Warner-Amex Satellite Entertainment) saying, “Ladies and gentlemen, rock and roll.” And so it began. Video Killed the Radio Star by the Buggles was the first video MTV broadcast back in August of 1981. It served as the perfect song to bring in this new era of music and to begin the MTV legacy. That was the beginning of something really great. However, when MTV Europe launched, it did play Money For Nothin by Dire Straits as its first song. MTV started in the US and then various other localised versions started to appear around the world (so technically the answer may be different for each network, but this is a question of the first ever song played). If you love the music of the 80s, the videos that went along with them were like icing on the cake. It was all new territory and video directors seized the opportunity with classic 80s excess. The playlist I created on this page (with the help of iTunes & Amazon) is just a sampling of the thousands of fabulous songs from the 80s. I did try to narrow down the 1000s of songs that make the 80s so awesome to a manageable 100+ of Billboard's top songs of the 80s. 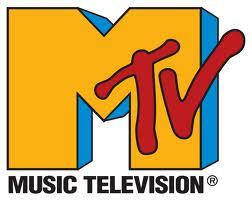 Prior to 1981, MTV didn’t exist and Prior to that, we didn’t have 24-7 access to MTV, its music videos and VJs. However, the MTV of the 80s was nothing like the MTV we see today. Did MTV of the 80s have “The Real Word?” Heck no. But it did have tons of music videos, awesome VJs and music news unavailable anywhere else. In fact, MTV of the 80s was waaaaay better than the MTV of today. What is left of MTV has little to do with “music” and more to do with pandering to the lowest common denominator. Do the names J.J. Jackson, Mark Goodman, Nina Blackwood, Alan Hunter, and Martha Quinn ring a bell? If you were alive and kicking (and watching MTV) in the 80s, they sure will. They served as the first 5 VJs (video jockeys) that introduced the videos played on MTV. In a recent interview with Nina Blackwood, she was asked how she feels about the direction taken by MTV away from the music. I agree completely with her answer, “I AM proud of what it was like in the early days and thankful to have been a part of it when the "M" actually stood for Music not Moronic as it does today.” It is also interesting that one the of biggest criticisms levelled at MTV now is that it doesn't play enough music video and it has become more of a mainstream lifestyle or realtiy TV channel. From most reports this is occuring with all the MTV video music networks. So there we were in 1981 being brainwashed with new slogans that would define the era (I want my MTV!) when in 1984, MTV introduced something that would forever change the face of the music industry. That is the year we were presented with the very first MTV Video Music Awards (VMA's) and suddenly the new generation had its very own awards show. 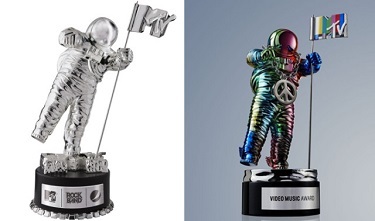 Moonman then and now. 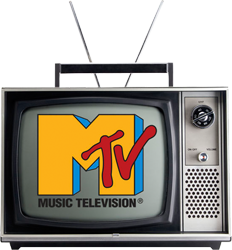 In the late 1980s, MTV began introducing non-music programming and slowly, over time, the flavor of MTV began to change. What happened to the MTV of the 80s? According to some it’s been replaced by a commercialized monster. However, we have our memories to keep us warm. And, I'm pleased to offer you, my classmates & guest members, over 100 greatest hit's of the 80's and some MTV nostalgia from the days when they actually played music videos. I hope you enjoy it! By the way, If there is an 80s song that you like or miss that I did not include here – Let me know and I will try to track it down for you. I set the playlist above to "random play" because many of the 80's artists during my uploads have multiple hits in the 80's all listed in alphabet order. But you can scroll the list of songs and find your personal favorit Greatest Hit's of the 80's. This collection of 80s music trivia will help you learn all those irrelevant, yet interesting facts that helped define this diverse decade. Michael Jackson's Thriller album of 1982 is the biggest selling album of all time, with over 42 million copies sold - and rising. There are many reports that Freddie Mercury of Queen recorded a track with Michael Jackson's for Thriller. However, this track has never surfaced in public. The guitarist that Michael Jackson's Beat It such a characteristic sound was Eddie Van Halen. Kim Wilde was originally known as Kim Smith. She was born November 18, 1960. Her first hit song in the UK, Australia and NZ was 'Kids In America', released in 1981. Oddly this single was not initially released in the US until a year later where it only managed top 40 status. John Mellencamp was never comfortable with the fact that he had changed his name to the stage name 'Johnny Cougar'. However, his success made it difficult to change back, so in the 80s he became the hybrid John Cougar Mellencamp. In 1984, Eurythmics and Van Halen released albums with the title 1984. The film based on George Orwell's 1984 was also released 1984. The very crappy film, Class of 1984, was released in 1982 (this was also Michael J. Fox's second film which appeared just before the 82 debut of Family Ties). Robert Smith of The Cure was also the guitarist in the early days of Siouxsie and the Banshees. Both jobs became too much, so he focused on The Cure. Kylie Minogue's first hit song was a cover version of Locomotion. The film clip also stars the Australian actress/comedian Tania Lacy. Duran Duran was named after a character in the 1960's film Barbarella. Jane Fonda played the lead and throughout the film she was searching for a character called Duran Duran. The club where Duran Duran started to play gigs was called Barbarella. The band paid tribute to this film in the late 90s song Electric Barbarella. After fading out in the late 80s, Duran Duran also made a brief comeback in 1993 with the song Ordinary World. Flock of Seagulls have a legendary reputation for their exotic 80s haircuts (see Hair Styles of the 80s and Wedding Singer ). This can be easily explained by the fact that the lead singer was a hairdresser before he joined the band (judging by the hairstyles it is obvious why he left hairdressing). Depeche Mode is named after the magazine of the same name and that names roughly translates as Fashion News. Mainly seen as an 80s band, the B52's formed in the mid 70s during a drunken evening at a Chinese restaurant. They were named after the large beehive hairstyle called a B52 (but not the plane or cocktail - even though the hairstyle was named after the plane). The five members were Kate Pierson, Cindy Wilson, Ricky Wilson (Cindy's older brother), Fred Schneider and Keith Strickland. On October 12, 1985, Ricky Wilson died. It was originally thought that his death was attributed to natural causes and some reports suggested cancer, but later it was revealed that he had died of AIDS. Originally, the group was called Hollycaust (after lead singer Holly Johnson and the paranoia of nuclear destruction that is evident in their single Two Tribes), but they changed their name to Frankie Goes to Hollywood. It was taken from an old headline about Frank Sinatra's movie career. After Spandau Ballet split up in 1990, one of the founding members, Gary Kemp, went on to start an acting career. He has since appeared in The Bodyguard, The Larry Sanders Show and Embrace of the Vampire. This is the guy who sang the 1984 song “Modern Day Delilah,” a tribute to the biblical villainess who cut Samson’s hair. Largely forgotten, the song is probably best remembered for its near-constant cosmetology puns (e.g. “she’ll cut you to the quick”, “blonds have more fun”). Stephenson died in 2001 from melanoma. Fun fact: The singer responsible for 1984’s “I Can Dream About You” also co-wrote James Brown’s “Living in America.” Decidedly NOT-Fun Fact: Hartman died of a brain tumor caused by AIDS, way back in 1994. The former lead singer of Survivor could not survive the battle with his demons: coroners reported that drugs — particularly meth — contributed to a fatal brain stroke in 2014. And here’s something else I learned recently: Jamison was not the “Eye of the Tiger” Guy. The band replaced that original lead singer with Jamison, who was the “High on You”/ “Search Is Over”/ “I Can’t Hold Back” Guy (and, as I also recently learned, The Guy Who Wrote the Theme to Baywatch). I’m cheating here, because I did know about the passing of Teena Marie — whose song “Lovergirl” reached #4 in 1984. I just didn’t know how she died . . . and now that I know, I wish I didn’t, because it’s quite tragic. Apparently, back in 2004, she suffered a concussion after a large picture frame fell on her head while she was sleeping in a hotel room. The blow caused seizures that would plague her for the rest of her life . . . and would ultimately kill her. Can you believe that? How many rock stars suffer Death by Picture Frame? No, not the Paul Young who sang “Every Time You Go Away,” but the Paul Young who was a lead singer with Mike + the Mechanics. And no, not the guy who sang “Silent Running” and “Living Years” (that was Paul Carrack, who also sang Squeeze’s “Tempted”), but the guy who sang “All I Need Is a Miracle” and “Taken In.” Got it? Anyway, this Paul Young died of a heart attack, at the age of 53. It is sadly fitting that the youngest Pointer Sister sang lead vocals on “Jump (For My Love),” because her life definitely had its ups and downs. Even when the Pointer Sisters were enjoying their greatest commercial success in the early 80s, June was battling cocaine addiction. She allegedly started taking drugs when she was just a teenager, and she could never break the habit; ultimately, her addiction led to her sisters ousting her from the band in 2000. She died not from a drug overdose, though, but from cancer, which had infected her breasts, liver, pancreas, lungs — basically, all over. She was only 52. Not exactly a household name, but Mr. Ham made at least two essential contributions to 80s music: as a former member of Men at Work, Ham played the saxophone solo for “Who Can It Be Now?” And the flute for “Down Under.” How cool is that? Sadly, though, controversy hangs over his “Down Under” solo, which was deemed too similar to a 1934 nursery rhyme named “Kookaburra.” Ham always claimed he didn’t deliberately copy the song, but the Australian courts still ruled against the band. Apparently, the whole plagiarism ordeal devastated Ham, who started drinking heavily and abusing heroin in the aftermath of the decision, according to Australian papers. Eventually, Greg Ham died of a heart attack in Melbourne, Australia. Who is he? Well, he is none other than one half of the band Buckner and Garcia, the duo who took their song “Pac-Man Fever” all the way to Number 9 on the Billboard charts back in 1982. And even though the song’s time in the spotlight lasted about as long as the “edible period” of the blue ghosts during the later levels of a Pac-Man game, the song still has an important legacy. In fact, if you think about it, “Pac-Man Fever” sums up in one package two signature aspects of the 80s: One-Hit Wonders and video game obsessions. His most popular album, 1981's Street Songs, launched him into superstardom thanks to the hit singles, "Give It To Me Baby" and "Super Freak", the latter song becoming his signature song for the rest of his life. James died from heart failure, at the age of 56. Though far from a product of the 1980s, David Bowie certainly made an indelible mark on the decade: he had a bunch of hit singles, including “China Girl,” “Modern Love,” “Blue Jean,” and “Let’s Dance” (which went to Number 1); he performed at Live Aid in 1985, and then released one of the songs he sang at the event, “Dancing in the Streets” (with Mick Jagger); heck, even Peter Schilling’s song “Major Tom (Coming Home)” is an homage to Bowie’s “Space Oddity.” In his song “Modern Love,” David Bowie says, “I never wave bye bye,” and that’s the way I feel about the 80s. So, to all the 80s performers who have passed away — both the obvious and un-obvious ones — thanks for doing your part, however small, to make the decade so memorable and un-bye-bye-able. So, yeah . . . Bowie is definitely an honorary 80s guy, and his recent death got me thinking about all the 80s performers and those of whom shuffled off this mortal planet. Of course, there are the obvious ones: Michael Jackson, Whitney Houston, Roy Orbison, Freddie Mercury, Glenn Frey, Marvin Gaye, George Harrison, Andy Gibb, Bob Marley, Laura Branigan, Joey Ramone and Dee Dee Ramone, two years after Joey. But then there are the un-obvious ones, performers whose deaths have sort of flown under the radar (or, at least, under my radar). Ben Orr - Singer/Guitarist - The Cars, Cliff Burton, Bass player Metallica, Doug Fieger, lead singer of the knack. Eric Carr, drummer for Kiss, Jeff Porcaro, member of ToTo, Joe Strummer of The Clash, Michael Hutchence, Lead singer of INXS, Rick James, 80's Funkmaster, Robert Palmer (Song - addicted to love). Steve Clark of Def Leppard, Ricky Wilson, The B-52's. I know what you're thinking (Take it easy); Glenn Frey? If you recall, The Eagles broke up in 1980, reunited 14 years later back in 1994. For many, the 1980s were a decade to remember, in terms of music. Anything from New Wave to Pop to Rock dominated the airwaves then – and even now. The 80s were a great time for catchy songs and over-the-top sounds. With this in mind, this 80s music trivia quiz is a celebration of that period. And with the 80s back in modern day fashion and music, this is also the perfect game for newcomers to that era.